Creatine is the best documented nutritional supplement on the market for increasing strength and muscle mass. However, there are many misconceptions about how it works and how to use it. In this article you'll learn more. Creatine is an amino acid found naturally in the diet, including meat, fish, berries and vegetables. Creatine Phosphate plays an important role in muscle cell energy metabolism, as a readily available source for the production of Adenosine triphosphate (ATP). ATP is the energy for short and explosive muscle activity. Creatine monohydrate is the most common and best documented in the form of creatine supplementation. It is normal to go up at least 1 kg in weight with the use of creatine, as long as you eat properly and drink enough water. Weight increase is due to muscle cell volumiseres with a higher water content, which in turn will increase muscle growth and strength potential. In practice, this means that creatine makes you more explosive and endurance so that you can lift heavier weights and more repetitions, which makes it possible to build muscle faster and more efficiently than normal. Creatine also acts directly through mechanisms at the cellular level in muscle, and simply put, the potential for muscle growth will be higher with regular creatine intake and exercise than training alone. There are also studies suggesting that creatine is a substance important for optimal brain function. Always use creatine monohydrate of pharmaceutical quality, which ensures that it does not contain impurities that can act in cheaper creatine supplementation. CreaPure is a recognized brand manufactured by Degussa in Germany, but there have been several brands on the market in recent years that also have high quality. Be happy about the dealer or manufacturer data sheets on the purity and quality, so you're sure. In recent years there have been several different variations and compounds of creatine which claims better absorption and effect, but very few of these have any scientific evidence that they work - and cost: efficacy ratio indicates the time being that "ordinary" Creatine monohydrate provides the best power for the money. After 3 weeks on creatine, you will have the maximum saving in the muscle, whether you take the typical charging phase 5g 5 times a day for 5 days, or not. The maintenance dose is in the range 3-6g per day, or 1-2 teaspoons. On training days we recommend taking creatine with protein immediately before exercise, as studies have shown a higher uptake as a result of the increased blood circulation during the training session. You can also distribute the dose to 2.5-5g (1-2 lastet teaspoons) before training and 2.5-5g after training. After training, you can take creatine with protein and carbohydrates. On rest days, take creatine for meals, or mixed in a protein shake. It is a common but misguided recommendation to take creatine during periods of 6-8 weeks, with stays of 3-4 weeks, and then repeat. The explanation for this recommendation is that we previously did not know the long-term effects of creatine on the body, but in recent years we have received a number of long-term studies that conclude that creatine is completely safe. Another reason is studies that showed a decrease in the absorption of creatine for 6 weeks, was misinterpreted that creatine stopped working. The truth is only that it is the body's way to tell if the bearings are full, and then it's simply not necessary with a maximum recording anymore. 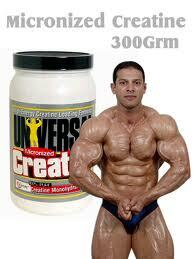 Some experience a lot of water retention and is inflated by the use of creatine. This can be reduced by both the use of best quality creatine, make sure that it is not expired, and split the daily dose into several smaller doses, such as 1-2 grams 2-3 times daily. Studies indicate that approximately 20% of the population are so-called non-responders, ie they do not get any immediate weight-or strength increases of creatine. The explanation for this is either that they eat so much creatine-containing foods that creatine stores are already full, or that the transport mechanism of creatine is saturated so that it can not be more creatine into the muscles. Anyway, it is highly probable that creatine supplementation will have effects at the cellular level in relation to the increased potential for muscle growth, which may not be immediately visible, but in the longer term will give better results than if you had not used it. Recommendations are to take 3-6g daily throughout the year for maximum results, divided into 2-3 doses throughout the day.